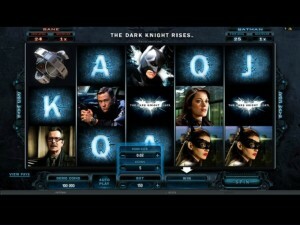 The second slot machine to be released based on a Batman movie, The Dark Knight Rises is themed around the third movie from the trilogy, while its predecessor used the second title for guidance. Since it is a game which is built under official license, you can expect to find images with the actors, Microgaming having permission to use their photos. 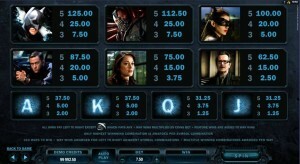 5 reels host 243 ways to win in The Dark Knight Rises. The free spins would be the main feature, but there are also wilds, scatter symbols, a Free Spins Accumulator and another feature called Symbol Scramble. One of the things I enjoyed most about this game is that they didn’t just use some very common features. They made them cooler, added some extra features and overall you will find it to be a game where you don’t get bored easily. 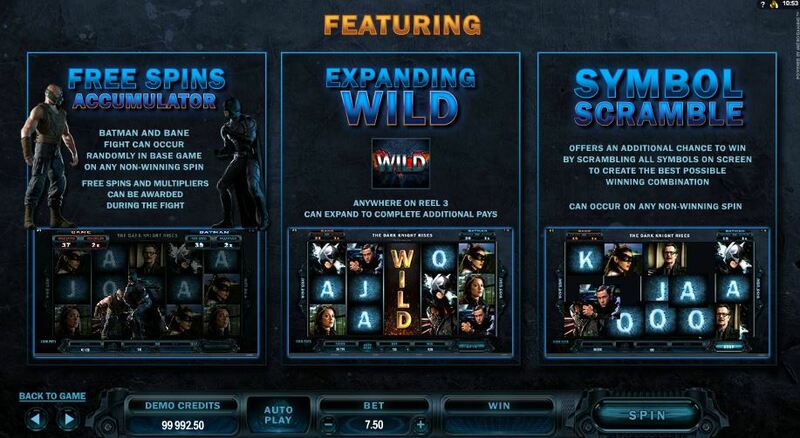 Things like the Free Spins Accumulator, the expanding wild, the Symbol Scramble, scatters, features and regular wilds, these are all features you will encounter in The Dark Knight Rises. The Logo is the game’s wild, like it often happens. You will get payouts of up to 5,000x directly from it if it manages to get its own combo formed, by landing up to five wilds together on a line. The rest of the time, it’s going to be useful as a symbol which substitutes for other symbols and helps them make new combos. The scatter is the only symbol which doesn’t get the wild’s help. The scatter symbol will show you some kind of weird round robot, though I’m not 100% sure that I’ve got it right. As a scatter, it will reward you from whatever position it lands in, as long as you have enough of these symbols present at the same time. Payouts vary from 1x to 50x the bet, for two to five symbols. 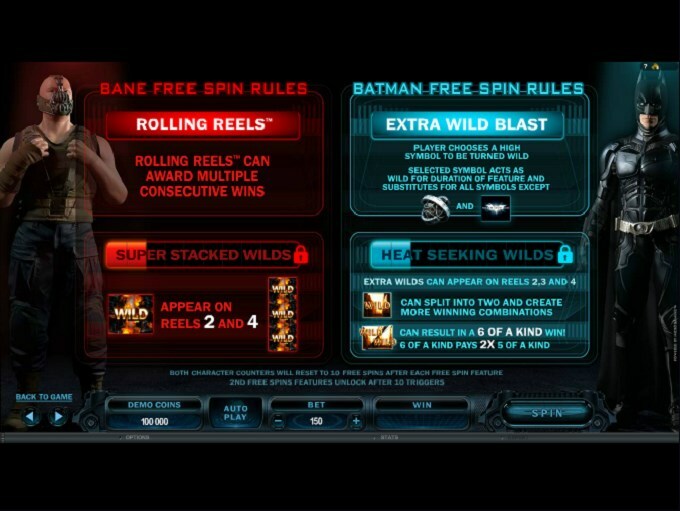 The free spins will start up when you have 3 to 5 scatters at the same time, in random positions on the reels. 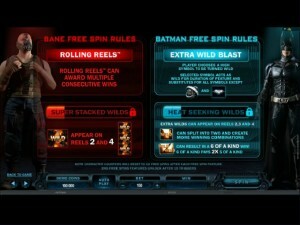 The free spins come under Batman or Bane mode, each one offering its own advantages. The Bane Mode gives you the Rolling Reels feature, where the symbols go off the screen when they form combinations, so that new ones can come in and take their place. 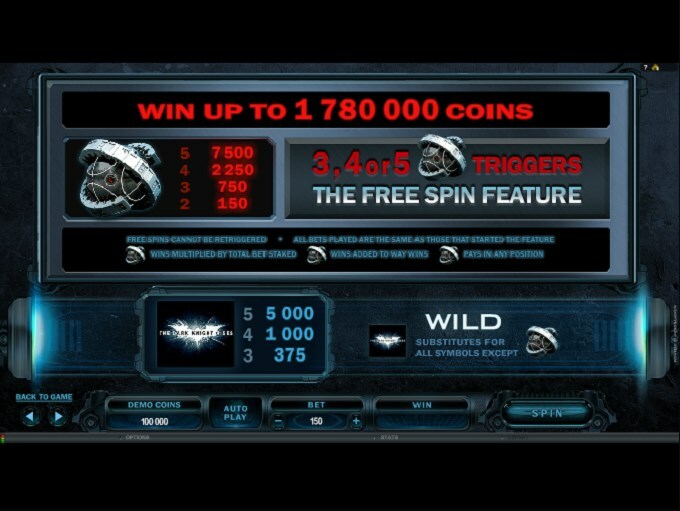 Multiple consecutive wins can be offered this way, from a single spin. You also have Super Stacked wilds during the free games, the symbols coming on the 2nd and 4th reels. 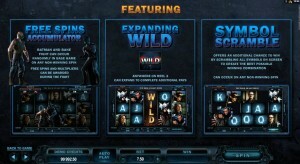 The Batman Mode has the Extra Wild Blast as the main feature, where you pick one of the high symbols to be used as a wild by the slot. It’s just one extra way of forming combinations. You also have Heat Seeking Wilds, which appear on the middle three reels. These can split into two wilds, so combos of six symbols become possible, with the prize being 2x the maximum value for that symbol. Another way to get free spins started is through a feature called a Free Spins Accumulator. You will find that the two protagonists, Batman and Bane, will start fighting on your reels from time to time. It’s randomly triggered, without any input from the symbols. 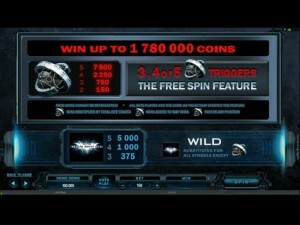 The fight can result in free spins and multipliers being awarded. One extra chance to get a win would be through a randomly triggered feature called Symbol Scramble. It scrambles the symbols available on the screen, trying to create the best possible winning combo out of them. Just like its predecessor, it offers low to average wagers and the prizes don’t offer much either as a result. The lines get up to $0.50, using 1 to 10 coins of $0.05. The most you can bet is $7.50 and this will cover all the ways to win. You are offered 5,000 coins in the jackpot, which for you means 1,000x the line bet. The cash value is only $250. I found it to be a better design than the first Dark Knight slot machine managed, perhaps because the symbols have lighter colors in them. The rest of the design is just as dark though. Photos of the actors make up a big chunk of the symbol line-up, with playing cards being the rest. You will like the design if you’re a fan of the movie, but you’re not going to find it impressive. Symbols: Wild Logo (wild), Game Logo (1,000x, wild), Drone (50x bet, scatter), Batman (500x), Bane (450x), Cat Woman (400x), John Blake (350x) , Miranda Tate (300x), James Gordon (250x), Ace (150x), King (150x), Queen (125x) and Jack (125x). 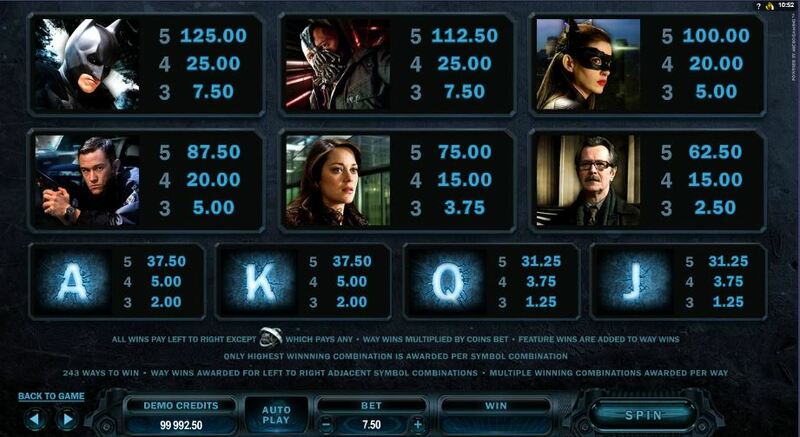 The slot is just as fun as the previous Dark Knight title, it has some very good features and a better design, but the prizes are even lower than before. It’s a good game to play just for fun, less in order to become rich. Released in 2012, this is the third and final movie of The Batman trilogy. Batman is played by Christian Bale, with the villain in this movie being Bane, while the second movie had The Joker in this role. The director has remained Christopher Nolan. Among the actors that had roles in this movie there is Bale, Michael Caine, Tom Hardy, Anne Hathaway, Marion Cotillard, Morgan Freeman and Joseph Gordon-Levitt. It was another very popular and profitable movie, just like the other titles in this series. It grossed more than $1 billion in theaters worldwide. 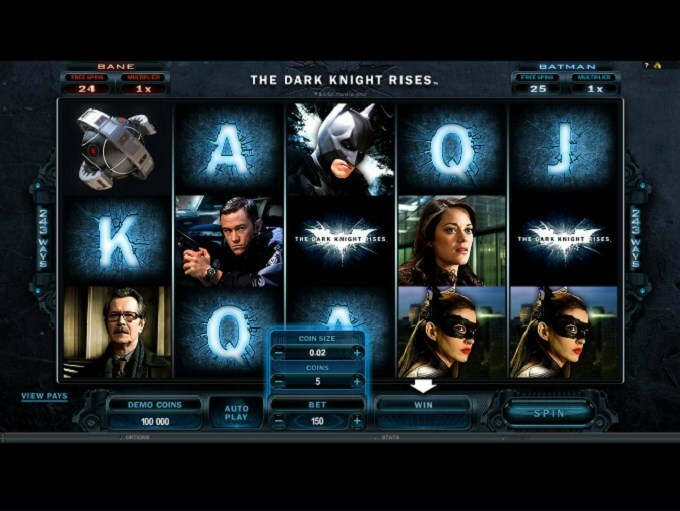 This The Dark Knight Rises slot is offered by all online casinos with Microgaming software, playable either in practice or in real money mode.